Last week this time I was lying on the sofa trying to recover from running 13.1 miles. Yes, that's right: I have checked off "Complete a half marathon" from my 31 before 32 list. Below is a little essay titled Why I Run that I wrote about the experience for GeorgiaMae.com. Enjoy! Sunday I completed the Mercedes Half-Marathon here in Birmingham. And I survived! There was good reason not to run 13.1 miles yesterday. I even had a doctor’s excuse. You see, I have a connective tissue disease that’s trying its best to destroy my joints and muscles. So my doctor is constantly discouraging me from high impact exercises and suggesting that I stick to water aerobics and cycling instead. As the day of the race drew closer and closer, I began to doubt myself. I began to wonder if I'd made a mistake signing up for this. "Why did you think you could actually do this?" I started to ask myself. But my husband and closest friends kept encouraging me and reminding me of all the training I'd been doing for months. They reminded me that during that training I had run 11 miles, twice, so two more would be a piece of cake. And they were right. Sort of. Not a single mile of the race was a cake walk. Thanks to the cold I couldn't feel my hands for the second half of the run even though I was wearing thick gloves. (Have you ever tried to tie your shoes with numb fingers? Doesn't go so well.) And thanks to that pesky connective tissue disease I spent most of the run battling an achy ankle, a throbbing knee or a stinging shin (though I'm thankful my body was kind enough to not allow all three to hurt at once). But I kept going. I kept reminding myself why I run in the first place and how those reasons outweigh all the factors that tell me I should stay home on the couch. I run because I have a disease that tells me I can’t. I run for all the women suffering from illnesses that prevent them from living their best lives. 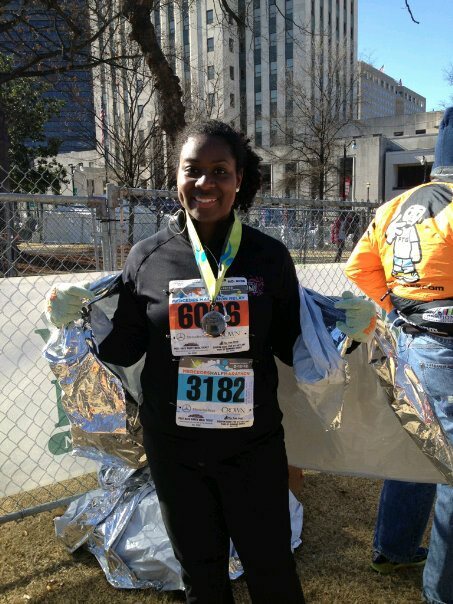 I run because the women of my running group Black Girls Run Birmingham convinced me that I could. I run so that women and girls of color can see someone who looks like them crossing the finish line. I run to defy the stereotype that we Southerners are all sedentary.